CyberGhost is a virtual private network that is headquartered in Romania. They built quite the reputation in the industry for being one of the more reliable network providers and offer a free option that allows users to get a taste for the quality of their services before committing to a subscription. They are one of the few virtual private networks that are transparent about their team and staff of employees that are committed to protecting your privacy. This transparency is a welcome addition in an industry where you are sometimes blindly trusting a network with your own privacy. CyberGhost offers a lot of similar features to what you will find with other top level private network providers. While they do not give the crazy amount of features that you will find at a company like PIA VPN, they do give users more than enough to ensure that their privacy is completely protected. One of the main benefits of CyberGhost is that they actually offer a high quality free plan that will be more than sufficient for most users. While their free option only allows for three hour long sessions at a time, it does just about everything you would want a reliable virtual private network to do. While there are many virtual private networks out there that do not log or have backups for user information, CyberGhost really takes this to another level due to their unique location. They understand how dangerous it can be for someone in a non-democratic country to voice their opinion and work hard to make sure that absolutely no one, including their own staff, has the ability to track what their users are doing. CyberGhost has been tested rigorously by both users and review websites for the type of speed that their VPN offers. They have passed all of these tests with flying colors and have become a favorite network for frequent torrent users and other individuals who download frequently while using a virtual private network. CyberGhost really goes out of their way to cater to travelers and individuals who will be using their network in several different areas. They have users in over two dozen countries and have proven time and time again that their services will be reliable no matter where you are using them from. Another main benefit of CyberGhost is that they cater to frequent mobile device users. Their app is very easy to use and does not become disconnected as easily as many other virtual private network providers’ apps tend to. With mobile usage continuing to rise, CyberGhost has put themselves at the forefront of protecting the privacy and security of mobile users. The security measures that CyberGhost utilize are as good as any in the industry. They have a 256-bit AES encryption, which is a level of security that compares to what most financial institutions provide. They also have over 250 servers in their network, giving them the ability to seamlessly bounce IP addresses from hundreds of thousands of locations. The VPN kill switch is another security feature that makes sure that your IP address is hidden at all times. The kill switch works by shutting off your internet connection whenever your VPN goes down. The customer support that CyberGhost offers is up there with some of the very best in the industry. They have a unique problem solver tool that actually makes it super efficient for users to get their questions answered and issues taken care of. They also have a help & FAQ section as well as a blog where they write consistent articles about issues that relate to the VPN community. On top of their self-help based support options, they also give you several options for contacting their staff about technical and other issues. They have specific email addresses depending on what you are looking for so be sure to check out their contact page if you are interested. One of the major beefs with CyberGhost by some reviewers is that they do not have servers in either Asia or Latin America. While this is true, the fact that they have over 250 servers in several different countries more than makes up for the lack of servers in those two continents. Another slight issue is that you cannot use their mobile app unless you have purchased a premium plan. While this is disappointing, you obviously cannot expect a for-profit company to give you too many great features for free. Lastly, some users have complained about the fact that you can only use their services on one device with their least expensive plan. You can, however, upgrade to five devices for only $3 more per month. CyberGhost offers three different packages for users, with only two of them being of the paid variety. Their most popular option is their Premium plan, which comes in at a very affordable $6.99/month when billed monthly. This plan features an easy-to-use mobile app, access to over 500 servers, and can be used on one device. The other option is their Premium Plus plan. The only major difference between the two is that the Plus plan allows you to use their VPN services on up to five different devices. The cost of this service is $10.99/month when billed monthly. Both plans are discounted when you commit to annual payments. While it can be difficult to decipher the differences between different virtual private networks, one of the main ways that networks can do this is through their ability to increase ping and download speed. CyberGhost is one of the few providers that can actually do this. Although it is generally considered a good thing when you do not notice your VPN is there, CyberGhost is an exception as you will undoubtedly notice the increased speeds when using their premium plans. With the fact that CyberGhost offers a free plan and provides some of the best customer support in the industry, they are one of the better options for users that want to get to know a little more about VPNs before committing to their use. 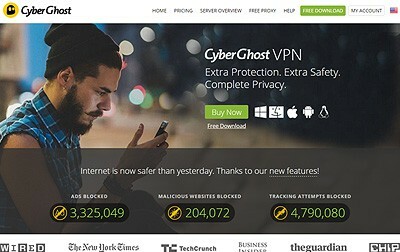 Whether you have never used a VPN before or have been using one for years, CyberGhost definitely delivers the goods when it comes to protecting your online privacy. Servers in over 24 countries. Fast connection speed. No logs and no tracking for maximum privacy. Downside: No servers in Asia or South America.